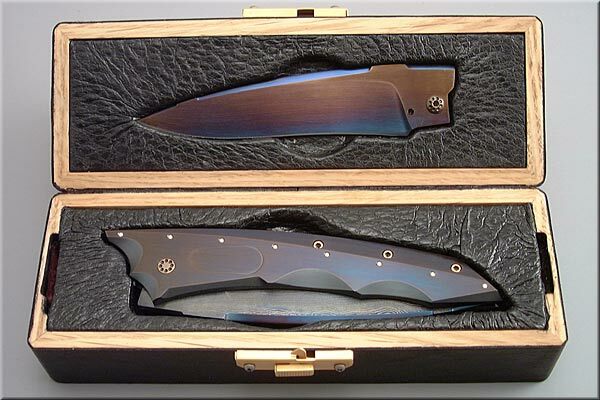 This is #1 of a limited edition of six blued Alphas. Each numbered accordingly and similar only in the basic profile and the fact that they are blued. 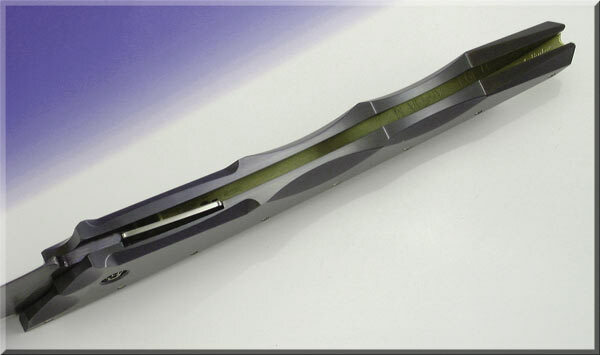 The knife itself features a flush inlayed steel button and an inlayed spring lever for locking. 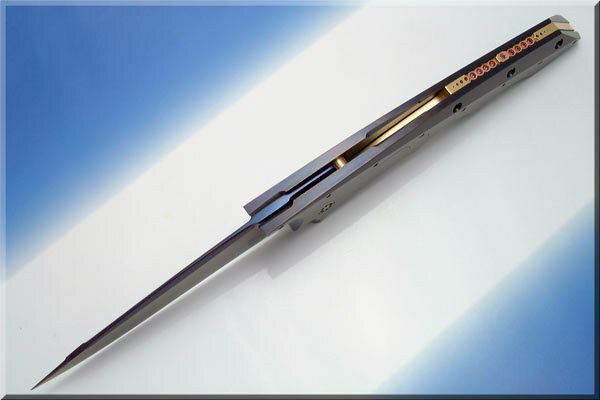 The rear spacer and kick spring are integrated into a one piece unit and in this M-Alpha it is 24k gold plated 1095 spring steel. The spacer/spring also has 9, 2mm. rubies, 8 of which are set in a textured relief. 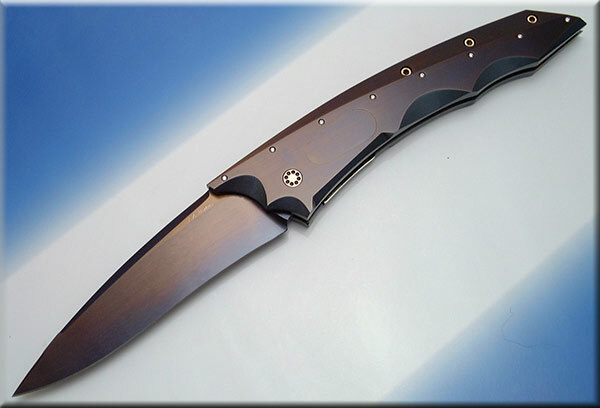 The frames of the knife are constructed of 1040c carbon steel. There are 18 hand ground facets on the inside and out, all of which were stoned and hand rubbed. The frames were resisted (masked) a multitude of times to achieve a variety of textures and colors. These textures serve to break up certain lines of flow as well as giving the knife an “Evolving Color” as it is handled. There 16, 1.5 mm. diamonds that flow along the main back facets of the frames. There are two blades are with the #1 M-Alpha. A one-off bar of Jerry Rados Damascus is installed, as well as what I call a “Wootz-alike” O-1 tool steel blade. The pattern of the Rados blade was kept linear so as to flow with the lines of the knife. The treatment of steel itself is unique, I believe, in that the upper layers have been textured and colored differently than the lower layers resulting in a curious refractive and reflective effect. This may have been done before but not that I am aware of. 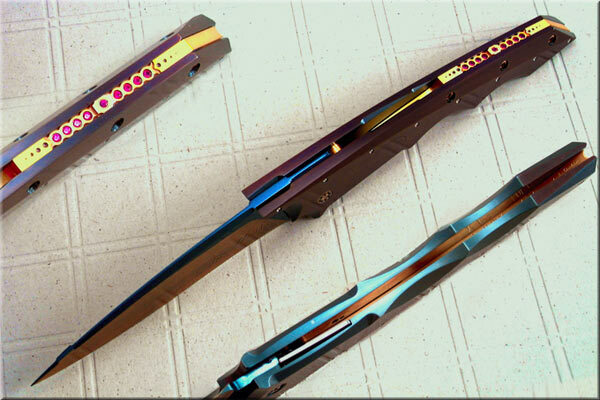 The second blade is non etched, and Nitre-blued in colors consistent with the frames. The presentation box is constructed of wood and leather. The outer plaque is made of carbon steel, cross grained and blued and reminiscent of black lip pearl when viewed in different lighting. The leather behind the plaque is Calabom lizard skin with an inner cushion of dyed ostrich hide. The second blade attaches to the lid with a latch is 24k gold plated. #2 Available for order and customizable per customers requests. Price based on various embellishments.